Reigning UFC light heavyweight king Jon Jones (pictured) was in a jovial mood following Saturday’s landslide unanimous decision victory over Glover Teixeira at UFC 172. 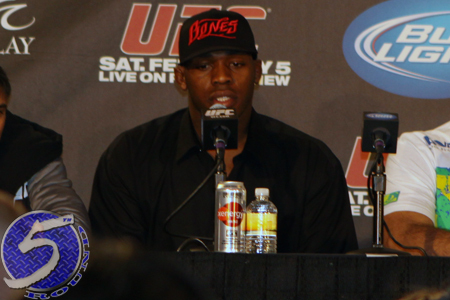 While Jones was more than happy to laugh, smile and dance at the UFC 172 post-fight press conference, he wasn’t in the mood to discuss his impending opponent. Jones gave the exact same response minutes later when the same question with different phrasing arose. Jones posted a controversial decision win over Gustafsson at UFC 165. The September shootout is considered by many pundits as the best light heavyweight fight in mixed martial arts history. Given his refusal to address Gustafsson, it’s clear there is some serious animosity there. Whether Jones wants to talk about the Swede or not doesn’t change the fact that the rematch is going to take place. When the sequel will go down has yet to be determined. One thing’s for sure, Jones is in no hurry to rush back into the octagon. Jones has now rattled off 11 straight wins, with his last seven being of the title defense variety.